A pool liner is a watertight PVC bag. It must be manufactured to the NF T 54 803-1 standard. • The liner, like all coating, makes the pool watertight. • It is strong: UV resistant, algae resistant or even non-slip, depending on the chosen options. • It can be fitted to any type of pool. • Liners adapt to the pool’s shape and size: corners, stairs, etc. Very accurate measurements therefore need to be taken to manufacture a tailor-made liner. • It is comfortable. 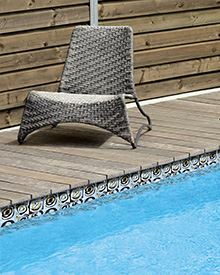 Its smooth surface is pleasant to the touch, and a pool liner cannot cause any injuries. • It is easy to maintain. • It can be replaced quickly. Ideal for refurbishment. • It is economic. A reliable solution to make pools watertight and customise them at a lower cost. There is a wide choice of pool liners. it varies from 0.20 mm to 0.85 mm. The most common thickness is 0.75 mm, considered to be sufficient to fulfil optimum installation, watertightness and durability conditions. Above-ground pool liners are usually thinner. Installing a pool liner is delicate work that should be left to pool professionals. Liners are easy to maintain, we recommend replacing them about every 10 years. Some Albon liners have been in place in pools for over 21 years. 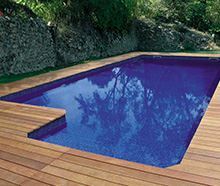 The price varies depending on the thickness, the quality and the selected treatments (non-slip for example), but also depending on the pool surface area and shape. • many years of pleasure!